This is a voluntary program, but all are encouraged to participate to help reduce disposal costs and to conserve natural resources; this is a curbside program so the recycle tote must be placed at the edge of the alley or on the curb to facilitate the transfer of the recyclables. 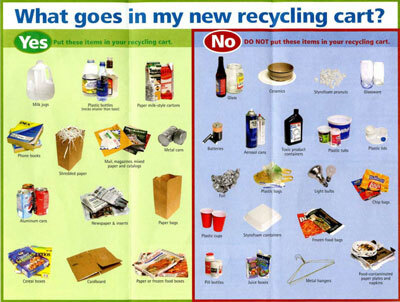 Aluminum Cans - Mostly pop cans; be sure the cans are empty. it is not mandatory; no aerosol cans.